Up for breakfast in Hesse St again. Can’t find the name of the place! Should take more notice. (Beaches – I looked). Muesli, fruit and yoghurt for me (no surprise there) and Peter’s usual bacon, eggs, chorizo (or there). Read the papers slowly then off to the Barwon Heads market. It really warmed up while we were having breakfast. Many jewellery stalls at the market with widely varying prices. Also found some mozzie repellent. I will try anything! They love me too much. Also got a stylish red sunhat! Peter bought some watermelon. Browsed the shops and who should I see but Mary’s daughter Michelle, and her daughter Jessica trying stuff on in a pop-up shop in the main street. With their cousin who lives near us! Walked around the rest of the shops. It was too hot so we came back to The Loft to chill out and have lunch with produce from The Farm Store in Hesse St! Think I’ll take a swim in the ocean now. Back soon! So much for my swim. The wind had changed and it was heaps cooler. Went for a walk along the ocean beach at the end of the street that the bowling club is in. Everyone was heading away from the beach. The sand hit your skin like little needles the wind was so strong. Saw another container ship go out and turn sharp left. Caught some seagulls splashing in the shallows. I think they were after what the tide was bringing in – whatever that was. Off to Kelp in Pt Lonsdale for dinner. Delicious food. For entree I had crab meat on a betel leaf. For main a steak that melted in my mouth. Peter had calamari and the snapper for a main. No room for dessert. Wasn’t anything I fancied anyway. This morning I rode to Barwon Heads market. A bit ambitious but I made it! 10kms to Ocean Grove and maybe another 5kms to Barwon Heads! Think I went the long way around. Seemed quicker coming back. Tons of jewellery at the market. Found a lady that makes Kumihimo style pieces! Talked to her for a while in between customers. Also saw the hand sewn seed bead necklaces like Pat and I tried to do at the craft fair. They were selling for only $20. Got some ideas though. May have another bash at it. Bought a pair of earrings made by Koranta who is 19 years old and lives in Lesotho, South Africa. He is an orphan because of the AIDS pandemic. 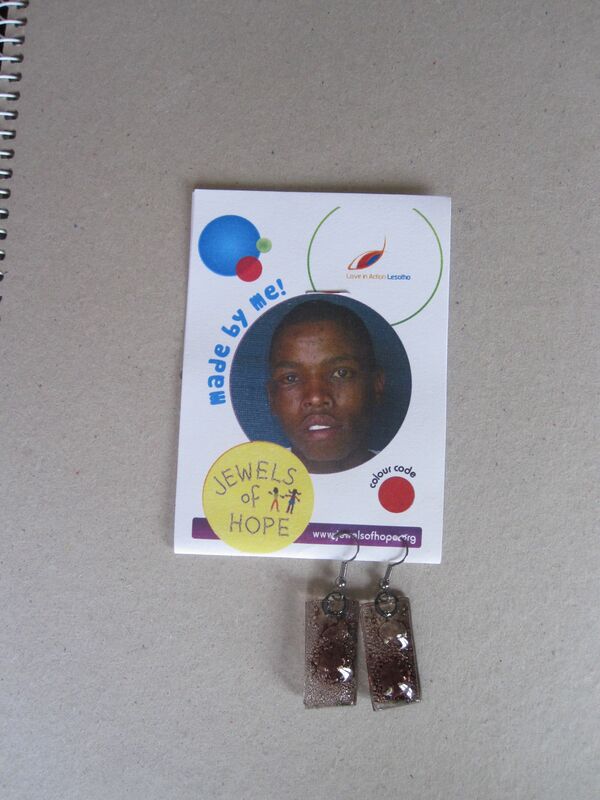 The Jewels of Hope project helps orphaned children. Quick lunch in Ocean Grove at the Voodoo Cafe then back to my room for a quick shower and on to Queenscliff for the historical walk. Five others joined me with Ken, our guide, for an hour and a half walk to look at buildings of significance with a few side stories. Afternoon tea at Athelstane House after with two Japanese ladies, Michael (Ken’s stepson) and another Michael and Aileen (who tried to convert me to God! No hope there). Meeting Steph at the Queenscliff market tomorrow. Maybe catch up for a coffee. Still deciding on where to have dinner tonight. Back to Queenscliff or Point Lonsdale again? Ahh decisions, decisions. Maybe back to Kelp in Point Lonsdale. Dinner there last night was delicious. Eye fillet steak and chocolate ambrosia to die for!